Home Entertainment Food Who makes a great Sweet & Spicy Grill Glaze? Who makes a great Sweet & Spicy Grill Glaze? Recently I met with Jennifer, she told me that she has been cooking for years, since early childhood. She remembers trying to cook all kinds of things throughout high school and college. She really got much better at it as a young adult. She started experimenting with different flavors in the kitchen. Some experiments were good and got better and some well, they just ended up in the trash. Over time she developed a love of having gourmet dinner parties for her friends. They loved it too. Around 1990 or so her Dad to let her write down his terrific recipe for his sweet BBQ sauce. He has been making it every since she was a child and it’s the best. He never uses measuring cups so it was a real stretch for him to measure while writing it all down. She began making ribs so much for her friends that they all just started raving about the sauce and how great it was and couldn’t understand why didn’t start her own business and make sauce. So one day while sitting at the beach her friends really started getting after her about taking the chance. They comment that got to her was “don’t waste it Jen, you don’t want to look back later and wonder what if I had ever done something with that sauce recipe.” So the challenge was born. Jennifer began hunting websites and promptly found one that had the headline of SO YOU WANT TO START YOUR OWN SAUCE COMPANY DO YOU? She couldn’t believe it. She found a co-packer in Ventura and they met many times at the IHop for inventory transfers-he in his unmarked van and her in my sedan. She said that she is sure that it looked funny. She’d drive back to San Diego with her little car so loaded down it’s a wonder it stopped at all. She originally started with 2 Grill Glaze sauces-Sweet Grill and Spicy Grill Glaze. The Sweet one was basically her dad’s recipe with a bit more garlic (‘cuz I like it). The Spicy one was not as sweet and had a really fun kick of heat (which is all mine-I like sweet and heat). In 2004, after about a year of fiddling she finally introduced her Steak Sauce and transformed 2 existing glazes into vegan products by eliminating the Worcheshire sauce. The Big Tangy Steak Sauce is a totally different flavor and usage than my glazes. It’s okay to sue this one as a marinade but it’s just as great on wings or pork if you like that Carolina vinegar-style BBQ sauce. The BBQ Sweet Heat is in response to heat-heads who think my Sweet & Spicy grill Glaze is not hot enough. It’s the same dry ingredients as the sauce. So to you, please feel free to rub it on, crust it up, sauce it up and sweat. It’s a really great rub solo, but a little does go a long way. 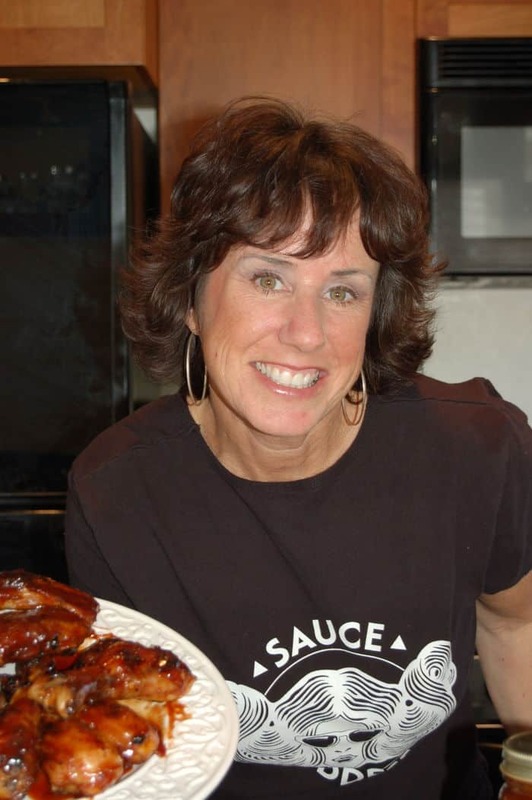 Lucky for her, Sauce Goddess has been continually growing from there with a strong following of consumers who return again and again to buy it. It doesn’t have to be hard to make good food. A few key ingredients can make it so special and different even it’s ordinary chicken, a good rub can make it so extraordinary. I love to make cooking easy for people. Along the way she has won a few awards with the Sweet & Spicy Grill Glaze, 3rd place 2004 Fiery Food Challenge and 2nd place in the 2005 Scovie Competition. If you like grilling and glazes then visit the Bacon Freak BBQ Sauce Club.